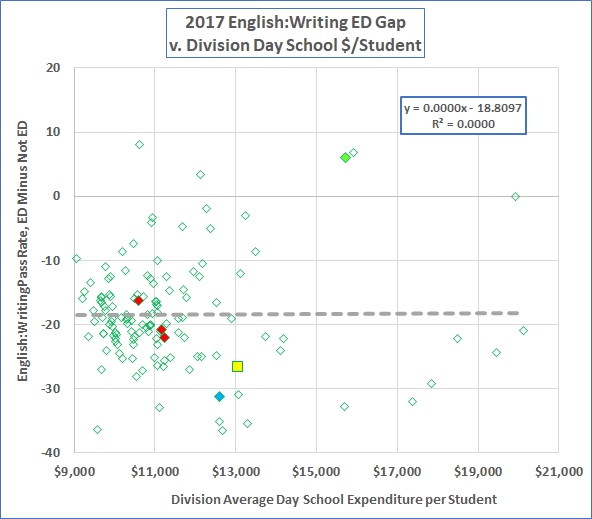 An earlier post examined the performance gap between Economically Disadvantaged (“ED”) students and their more affluent peers (“Not ED”). The estimable Jim Bacon commented on the post (TY, Kind Sir!). 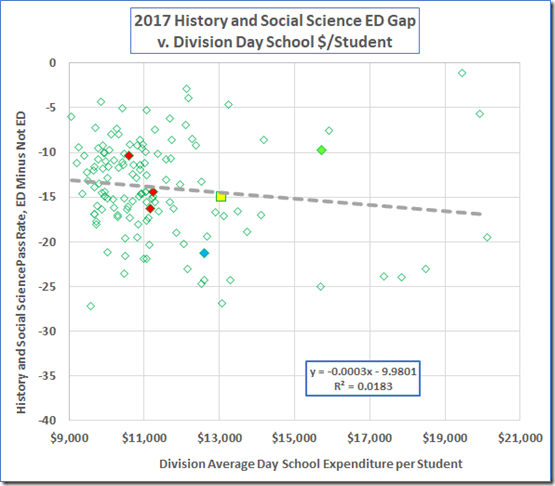 The likewise estimable Steve Haner (a former colleague who is a Fine Fellow, although sometimes nearly as cranky as yours truly) posted a comment to the Bacon post, pointing out that the performance gap might well support a demand for more school funding. 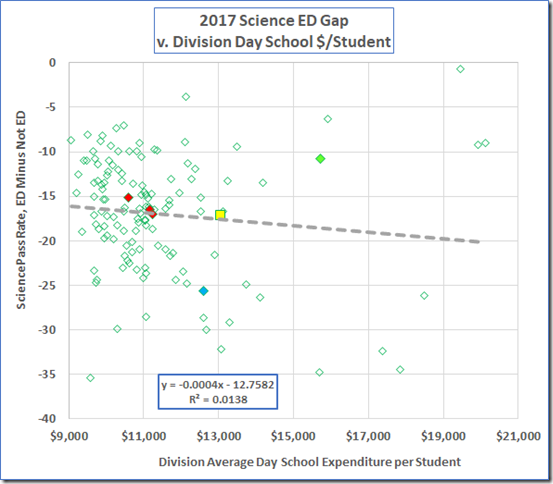 We have some data on that. 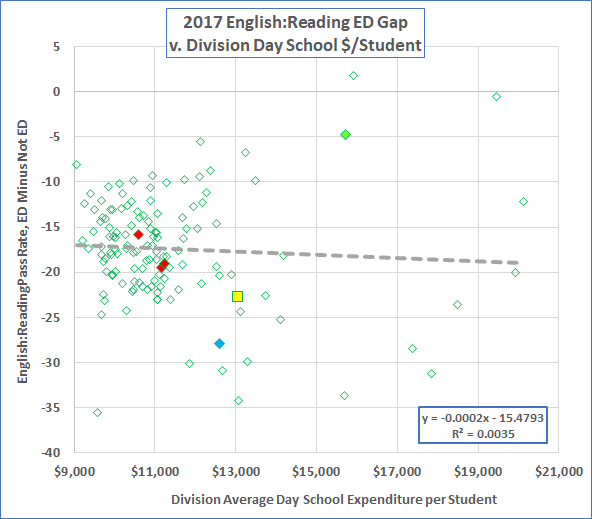 To start, here is the 2017 division average Gap, ED pass rate minus Not ED, plotted vs. the division day school disbursement per student (the most recent disbursement data are 2017). The slope of the fitted line (ca. 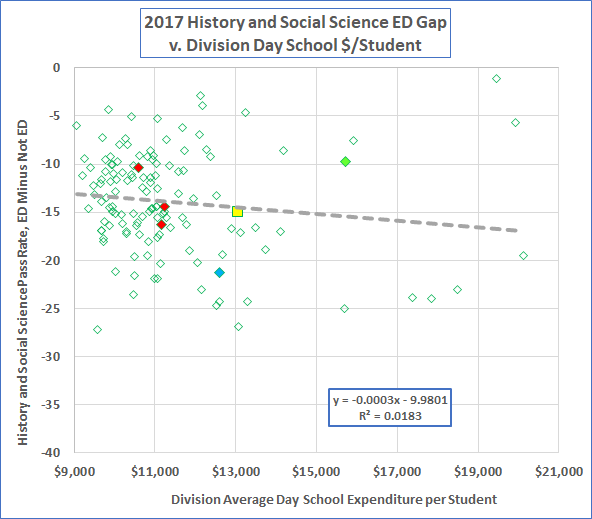 -0.2% per thousand dollars) suggests that the gap increases with increasing day school expenditure but the R-Squared value tells us that the two variables are not correlated. Richmond is the yellow square point. 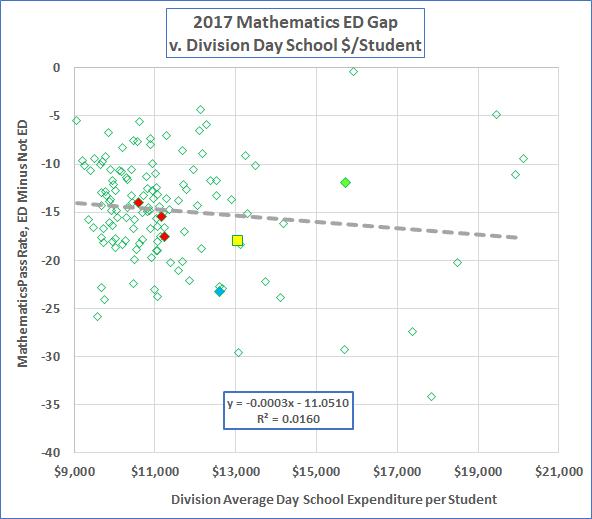 The red diamonds, from the left, are the peer cities Hampton, Newport News, and Norfolk. 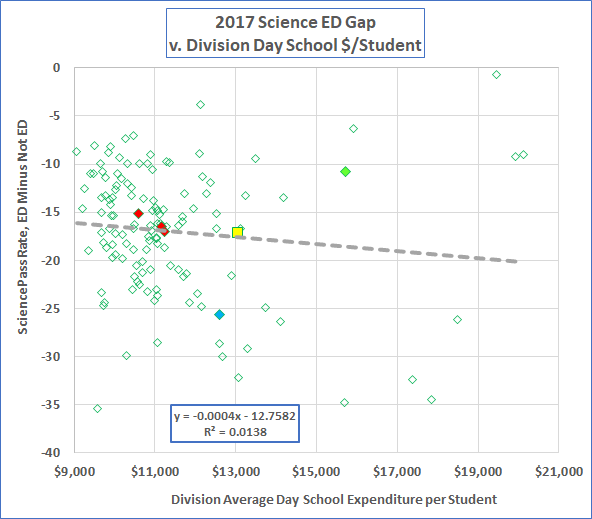 Charles City is green; Lynchburg, blue. 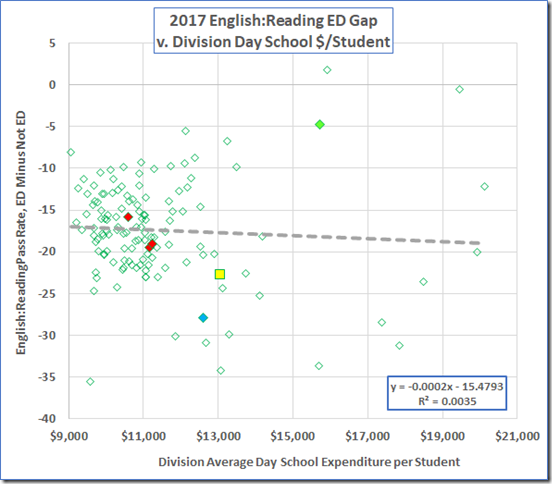 The anomalous datum at $15,916 and +1.79 (ED students outperforming the Not ED) is Sussex. The nearly-as-anomalous ($19,468,-0.66) is Bath. 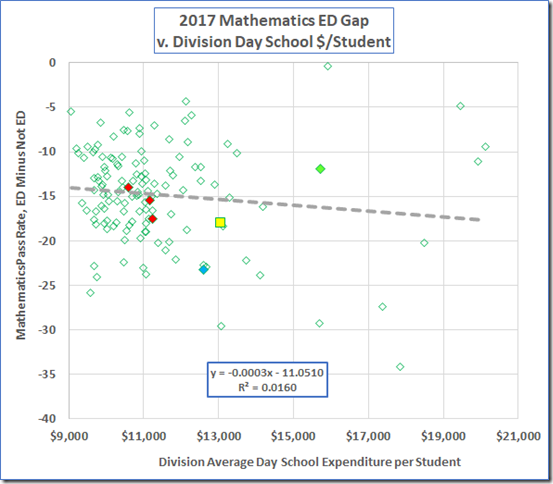 The bottom line: Some divisions do better; some do worse; the amount of money doesn’t correlate with the performance difference. None of the other subjects suggests otherwise. 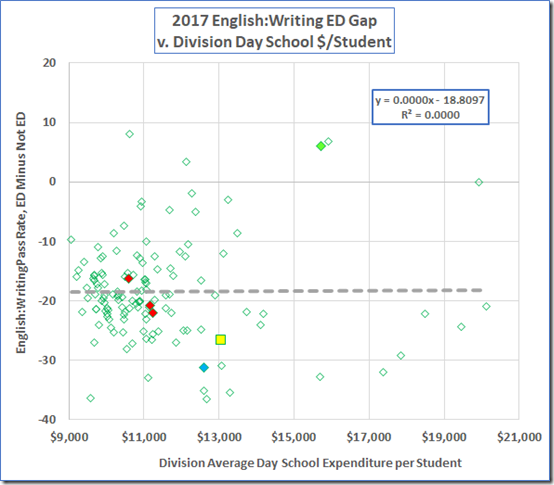 At the division level, these data say that, on average, the Not ED students considerably outperform the ED students on the SOL tests and that more money per student does not relieve that difference.